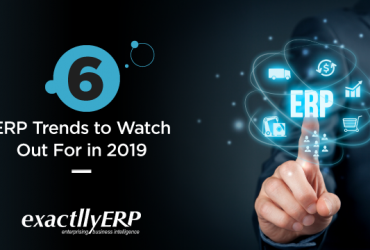 Customer Relationship Management tools have drastically changed in the last few years along with multiple emerging technologies. 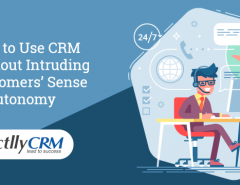 Just a couple of decades ago, the basic CRM tools helped businesses to manage their leads, access contact information and sort out prospects based on various parameters. 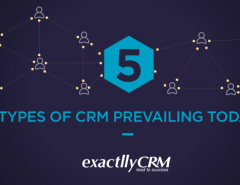 In the last few years, CRM has grown so advanced that it can practically be integrated with any other software tool in order to reap multiple business benefits. A mobile-first approach has helped CRM developers to bring customer relationship management to employees’ mobile devices. CRM is expected to change even more dramatically in the coming few years. In this article, we take a look at 5 emerging technologies that will change the CRM as we know it. Internet of Things is no more an emerging technology but integrating CRM with IoT sensors is an emerging trend. Many product manufacturers have begun to implement sensor-based after-sales support in order to implement predictive maintenance. Predictive maintenance is vastly different from reactive maintenance, which is to offer support when a certain product malfunctions. Sensors can detect when a product isn’t behaving normally and predict when it needs to be serviced. Using IoT sensors and integrating them with CRM can help you to offer predictive maintenance to your customers so that their satisfaction levels remain high. As mobile CRM is increasingly common among business users, it only makes sense to use technologies already available on a smartphone. This includes the humble smartphone camera, which when integrated with CRM can prove to be an effective tool to communicate with customers. Customers can quickly upload documents, photographs of products, or verify their own identity right from your official app. The possibilities are endless, and many businesses who choose to launch mobile applications now integrate camera into their apps. It can also prove to be an effective self-service tool for customers, enhancing their user experience. Another quick and easy way to use emerging technology is to integrate GPS with your mobile CRM. This is particularly useful to communicate with your customers when they are nearby and send them offers and discounts. GPS is being used to enhance marketing campaigns and offer a sense of immediacy to customers. In addition, GPS can also be used to locate customer location especially when field staff need to make maintenance visits. Of course, detecting GPS location of customers during maintenance visits need to be authenticated and permitted by the customers and only for a certain duration until the staff locates the address. Chatbots and virtual assistants are being integrated with CRM in order to introduce customer self service. Customers no longer need to wait for a real person to resolve their issues as artificial intelligence-enabled chatbots can assist customers too. In addition, AI-influenced technologies such as machine learning and deep learning understand underlying customer behavior patterns. This kind of insight has real business implications such as product improvement, UX enhancement, and customer behavior prediction. Many businesses are already using text analysis and natural language processing to understand hidden meanings in customer interactions. It wouldn’t be an exaggeration to say that AI can effectively reduce churn rate. If you thought blockchain use cases were limited to the uber successful financial and security companies, think again. Blockchain-based smart contracts are coming to CRM sooner than you may imagine. Smart contracts help businesses to receive customer consent in a variety of situations, making it easier to authenticate and verify support requests. In addition, warranty claims and refunds can also be processed when blockchain-based smart contracts are enabled. Research shows that when there is a heightened sense of security and safety, customer satisfaction increases. After all, that is the basic point of using a CRM anyway and blockchain helps you enhance customer satisfaction almost immediately. 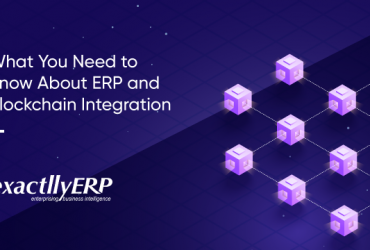 Most businesses do not take their CRM ahead of integrating with their ERP or e-commerce websites. However, a CRM can do a lot more than you can ever imagine. Bring predictive maintenance to your customers and watch CSAT scores soar by integrating IoT sensors with your CRM. Photo detection tools can be integrated into your mobile CRM to enhance product support and customer verification. GPS can also be used to detect customer location during maintenance visits and to notify when they are near your brick and mortar stores. 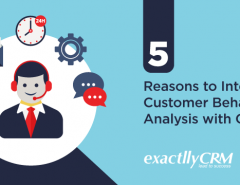 Artificial Intelligence takes your CRM to the next level by integrating text analysis, natural language processing, and chatbots, and provides you with valuable insight. Finally, blockchain-based smart contracts can be used to authenticate and verify customer interactions. As you can see, implementing these emerging technologies will give you a competitive edge over other businesses.